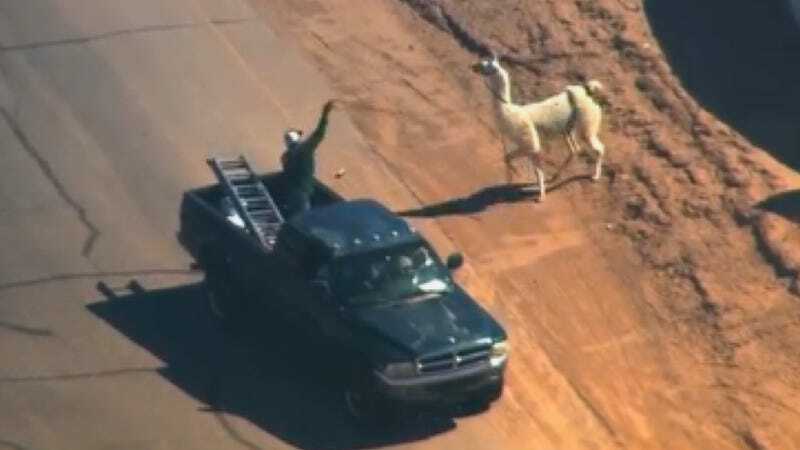 Citizens and police of Sun City, Arizona banded together today to chase a pair of runaway llamas. One was caught by folks on foot, other had to be wrangled by some cowboys slinging a lasso from the back of an old Dodge. Best moment on TV today, which Chrysler was impressively quick to leverage. Can't blame FCA for a little lighthearted #brands humor. 'Cause you wouldn't have a chance wranglin' llama in that Ferd or Chebby, ya fancypants pansy. Oh man imagine if only that rope'd been thrown from a Jeep Wrangler? Still waiting to hear where the llamas escaped from, or why the #llamadrama wasn't shut down immediately with one of those tranquilizer guns I've heard about.